This is a learn-as-you-sew pattern. Learn essential tips and techniques about sewing with cork fabric as you create this proejct! Learn step-by-step how to create a professional looking bag. 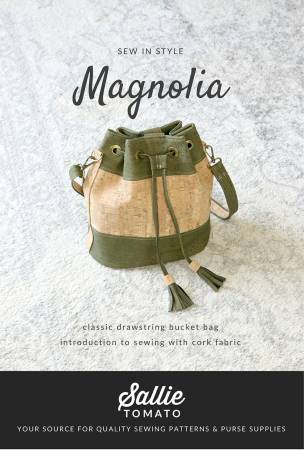 The Magnolia Bucket Bag has a casual, classic look that can be made with a drawstring or without. Inside the bag you will find a magnetic closure, interior zipper pocket, and key fob. The finished size of this bag is 9-1/2in wide at base, 12in high, and 5-1/2" deep. The yardage has been carefully calculated so you will get the most our of your cork fabric.